An act of love, a voluntary taking on oneself of some of the pain of the world, increases the courage and love and hope of all. on friday the world press photo of the year for 2008 was announced. the photo is a very powerful and stark image which captures a different type of conflict that is waging around the world. in fact, the image was selected because of it's resemblance to the powerful images that are found in classic war photography. "Now war in its classic sense is coming into people's houses because they can't pay their mortgages," jury chair MaryAnne Golon said. Fellow juror Akinbode Akinbiyi said: "All over the world people will be thinking: 'This is what is happening to all of us'." the winning photograph was taken in cleveland, by anthony suau and shows an armed officer from the cuyahoga county sheriff’s office moving through a home after an eviction which was a result of foreclosure. the photo was taken in march of 2008 and was part of a photographic series time magazine published on the national economic crisis. to see all of the photos in suau's photographic essay the american economy: down and out click here. dr john and odetta performing yip harburg's 1931 classic brother can you spare a dime. this video by someone called spadecaller shows the song's continued relevance by including images of what is happening today to the poor and disenfranchised of our country. That is a powerful vidoe, Mouse. Without knowing it, you've helped me and gave me ideas for my lesson tomorrow. Planning on talking to my students about the US educational system and current status. Great video and song! Sent the photo award info to my husband, the photographer. Watched the video and listened to the song, which I know very well. Judy Collins does a version that makes me cry. The visuals are painful. Obama is right. Whatever we go through now, we all need to pitch in and volunteer and provide for each other. Thank you for reminding us. My God! that photo! I am sickened. thanks for sharing. You know when you are down a good look at others who are truly really down somehow makes you feel better? This did it! Thanks for sharing the winning photograph and the video....also the kitties. The prize-winning photo (and his photo essay that it was a part of) and the video really drive home what's going on in the world today. Great stuff. And it was good to hear Odetta again. 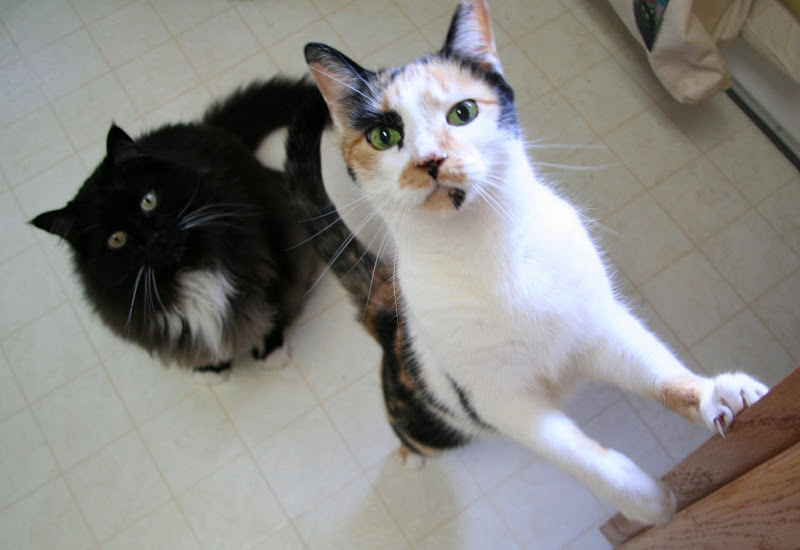 And I think those two kitties are saying "Sister, can you spare some tuna?" That's how ours used to react if they heard you starting to open a can. Any can. As far as they were concerned, the sound of the can opener meant food was coming. That photo essay is powerful. Great work and thank you for showcasing it. I know all of northern Ohio has been taking a hit for years/decades now. Toledo's having some success with solar panels. I'm hoping the whole state can create manufacturing jobs along the same lines. We've got a whole town down here unemployed with DHL pulling out. It's heartbreaking. My mother lived through the Great Depression as a child. I've heard stories like this all my life. I never thought I would see this country going through the same experience again. Helping one another and curbing our greed is the only way to survive. Thanks for the poignant post. I really felt the power of Dorothy Day's comment. Unselfish and unconditional love curbs the greed that will if not curbed destroy us from within. looking at the picture of the cats in relation with the rest of your post, I can't help thinking how even the poorest of us in the blogosphere are incredibly rich and privileged compared to those who not only don't have the essentials for their physical sustenance but the essentials in terms of access to other minds, cultures, opinions. That is the worst part of poverty. It can lead to despair. It can lead to striking out in anger. Occasionally, it can lead to reaching out in sympathy to fellow-sufferers. But paradoxically, it usually leads to pride in and attachment to one's own misery when it becomes one's only wordly possession - a state of mind akin to that terrible physical condition known as the locked-in syndrome. We humans are complicated, aren't we? Great photos, great song. And the fire dog from Québec says to send a 'bonjour et salutations' to the delegate from Cleveland. Hello to a fellow Buckeye! I'm here by way of Don Parker. Thanks for the smiles this morning! and what an experience to read mariannna's comment that this post written in cleveland sparked some thoughts for her to incorporate some ideas into a lesson plan for students in greece! isn't it wonderful to be a part of the cyberhood? can't you just hear the mr. roger's tune! cal girl - right on! we do each need to give back! megan - there are pockets of tragedy and economic horror everywhere.... it's sad, but we are all gonna work together to make it better - right!? Ah, what a lovely tortoiseshell cat, like our Scabby. very powerful--thanks for sharing it. Helping others empowers all of us. I happened to select "The Grapes of Wrath" off of the library bookshelf to listen to in the car as a I commute to and from work. I read it long ago, but it's good to "hear" it afresh. As I listen, I'm struck by just how relevant that old story is today - back then it was a dustbowl causing foreclosure, now it's the economy. But, the end results are so similar...sad and hungry families, lost homes and memories, and uncertain futures. Oh, so you're a native nutmegger! Very interesting. I live in the Columbus area and as far as being a buckeye is concerned, I'm not really a big football fan, just an Ohioan. And some people can't even think as far as the state where they were elected, ie anything out of the beltway is terra incognita. My father grew up during the Depression, and he never really got past it. He was always frugal, even when he was making plenty of money. I don't think he was conscious of the fear, but it was a part of the way he saw the world. Now,to see families losing everything is so shocking. To know it will be worse before it gets better is just plain scary. One positive effect that I do see is the tentative re-building of communities. Also, I think, a re-ordering of priorities. Great visual and auditory post, Kim!